Leh, Ladakh, J&K, India – A short drive this morning took His Holiness the Dalai Lama from Shiwatsel Phodrang to the SOS Tibetan Children’s Village School in Choglamsar. The Director and Principal met him on arrival, while the children provided a traditional welcome that included the ‘chema changpu’ offering and the Tashi Shölpa dance. As he walked to the covered stage above the school ground, His Holiness greeted and reached out to the many elderly and infirm people waiting in hope of seeing him. In a summary report, the School Director, Chemey Lhundup, explained that the school was established in 1975 and at present has 1653 students and 246 staff. He announced that students would give a presentation of debate. The challengers opened with lines from Dharmakirti’s ‘Commentary on Valid Cognition’ (Pramanavarttika) and continued to discuss aspects of colour. In a report about the Tibetan community in Ladakh, the Tibetan Settlement Officer recalled that to begin with there were only 500 Tibetan nomads in Ladakh. In the 1970s, 4000 more Tibetans arrived and the population at present has reached 7000. He expressed popular appreciation of the introduction of democracy to the administration. He also mentioned that, although there had initially been a plan to provide Tibetans with land to farm, little came of it, so most of them turned to business. He noted that the community gets together to celebrate special occasions like His Holiness’s birthday and the anniversary of his being awarded the Nobel Peace Prize, and that they make a point of preparing only vegetarian food. There followed a cultural performance by adults from the Sonamling settlement who danced and sang. The theme of the song was that they had not expected to encounter the Omniscient One, and here he was seated on the throne—may there be prosperity and happiness. After presenting tokens of gratitude to local dignitaries such as the Chief Executive of the Council, the Addl. Deputy District Commissioner and the President of the Ladakh Buddhist Association, His Holiness addressed the gathering. 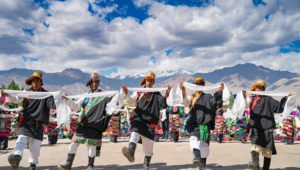 “Tibetans in Ladakh have been in exile for about 50 years and although one generation is giving way to another, the Tibetan spirit continues remain strong. I’m happy to see all of you and our guests here today. “We Tibetans who live freely in exile need to speak up for the 6 million Tibetans at home in Tibet, who are unable to speak for themselves. I don’t have any criticism to make of the Chinese people in general. Since the time of Songtsen Gampo in the 7th century we’ve maintained relations with the Chinese. They have been following the Nalanda Tradition of Buddhism longer than we have. I have no resentment towards the Chinese people for what’s happened to us, but among hard-line Chinese officials are many who are rigid and narrow minded. “Historically the Chinese, Mongolian and Tibetan empires stood apart. Now, however, hard-liners have overpowered Tibetans as part of what they called peaceful liberation. And what they have referred to since 1951 as the Tibet Autonomous Region is only part of the territory that used to look to the Ganden Phodrang government. “Employing all kinds of measures to subjugate Tibetans, the Chinese authorities have tried to eliminate the Tibetan identity. However, while physical controls can limit and confine people’s physical movements, they can’t control their minds. When they make people suffer, how can they expect a positive response? Hundreds of thousands of Tibetans have died in the course of this struggle. “In the face of such suffering it’s our responsibility to speak up for their rights and freedoms, clear in the knowledge that we will only achieve change through education and awareness, not by resorting to force. His Holiness went on to explain that although the Chinese follow aspects of the Nalanda Tradition, they did not adopt the use of reason and logic. There may be 1 billion Buddhists in the world, he said, but those who employ the rigorous logic of Dignaga and Dharmakirti are few. He observed that the knowledge preserved in the Tibetan tradition that deals with tackling negative emotions continues to be relevant today. Turning to the elderly in the audience, His Holiness advised that as death comes nearer day by day, it is good to take refuge in the Three Jewels, cultivate a warm heart and recite ‘Mani’ and ‘Tara’ mantras. Appreciating the way the young students had debated, His Holiness recalled that Shantarakshita had introduced the study of philosophy, logic and debate to Tibet in the 8th century. It was later further formulated by Chapa Chökyi Sengey (1109-69), the Abbot of Sangphu. He remarked that as an investigative technique debate can be applied to other topics too, which is why he is encouraging modern students to take it up. The Tibetan use of logic and debate is something even scientists admire. “Although the Tibetan state fragmented after the 9th century,” His Holiness observed, “our common language is something that has kept us together. And today that remains true in Ladakh, the Himalayan region and the Mongolian regions as well. Today, we have the opportunity not only to keep our traditions alive, but to share what we know with the world at large. This is something the younger generation have an opportunity to do, so it’s important not to become complacent in your studies. “China will change. Over the last 20 years there has been change even under the same regime. We have truth on our side and that won’t change. Don’t lose your pride and confidence in being Tibetan. “In our early years in exile we approached the UN. However, Nehru was clear that we would have to deal with China directly. He told me that neither the UN nor the USA would go to war with China over Tibet. Consequently, in 1974 we decided not to make independence our goal. We are a different people with our own language and we are due our rights. But we felt we could pursue them through what is written in the Chinese constitution, which would allow us to control our own affairs. Having our own language and identity doesn’t mean we need to separate from China. This is why we adopted a Middle Way Approach. In expressing words of thanks, the School Director thanked His Holiness for coming to speak to the school and the people of the Sonamling Settlement. He expressed gratitude to the Government and People of India for their support and requested that it continue. 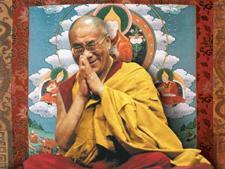 Finally, he wished that His Holiness live long and that the Tibetan cause be fulfilled soon.